If you're thinking about buying the Vietnamese Dong, you've probably already done some homework. That's important, because the more you know about a foreign currency the more successful you're likely to be in your purchase. You'll want to have good information, and work with a leading dealer. Whether you're buying the Dong for your collection of colorful world currencies, or whether you're looking toward future currency exchange with a top dealer such as Currency Liquidator. Over the past few years the Vietnamese economy and the Dong have begun to attract plenty of attention from observers, mostly because of the economy's rapid growth rate. An increasing number of people worldwide are discovering Vietnam's economic success story. Observers point to the fact thatVietnam has overtaken China and other Asian nations with regard to growth in most sectors. In 1946 Vietnam held its first elections for the National Assembly, and it also introduced the đồng to replace the French piastre at par value, that is, 1:1 with each đồng equal to one piastre. Again in 1958 the second revaluation made each đồng worth 1,000 piastres. During this era, France continued to exert influence in the country's political landscape. Eventually there were also circulating banknotes dually-denominated in both piastres and đồng. By late 1946 Vietnamese nationalist groups were at open war with the French, in what was called the Indochina War. Realizing that the era of colonialism was almost over, in order to preserve its influence France helped create a semi-autonomous State of Vietnam as a member of the French Union. The short-lived state was led by Bảo Đại, the thirteenth and final emperor of the last dynasty in Vietnam. Before being chosen as a puppet by the French, between 1926 to 1945 Bảo Đại was King of Annam, a tiny principality neighboring Vietnam. After suffering a decisive defeat in 1954, France gave up its colonial holdings in Indochina. However, once the French were expelled, Vietnam was separated into two political rival nations. The 1954 peace agreement left Vietnam divided into the Communist North backed by the Soviet Union and the South with a republican government backed by the U.S.
Vietnam's economy has been expanding rapidly during the past few years. The country is rated as having Asia's fastest-growing economy year after year. And, the pace of development and wealth-building in Vietnam is far greater than in China's now-sluggish economy. Over the past few years Vietnam's economy has grown between 6% to 10% per year, which is remarkable when compared with other countries in the region. Most importantly, unlike most other resource-rich nations Vietnam also boasts an innovative, cost-competitive manufacturing sector as well. yet it also has a strong technology and manufacturing business sector. This diverse industrial sector gives the economy a broad base to cushion the Vietnamese people from the shocks of a too-narrow economic base. For example, a nation such as Iraq relies on a single product, oil, for the majority of its economic activity. In contrast, Vietnam enjoys a much broader industrial base. In any event, the nation's economy is booming and there's plenty of new development underway everywhere. Still, although the Vietnamese economy continues to outperform its neighbors throughout Asia, the foreign-exchange rate for the Dong hasn't kept up. The Dong's value has stayed about the same during the past few years, even while the country's economy has improved dramatically. Ultimately, the value of a nation's currency is based on the overall strength of the economy, including the balance between wealth from natural resources and manufacturing capability. Vietnam is perfectly positioned for a better economic future, which is why so many people are so enthusiastic about the economy. The Vietnamese economy is stable and growing steadily. Between 2007 and 2014 the economy nearly doubled its output. Vietnamese citizens' income levels are rising, and the middle class is growing quickly. And, there has also been slow, steady progress in implementing anti-corruption measures at the local, regional and national levels of government. The government appears fully committed to reforming the banking sector and other regulated industries. Exports of manufactured products are increasing yearly. Due to superior quality and affordability, many international manufacturers outsource their most important components from Vietnamese manufacturers. The country is especially well-known for the quality of its mobile phone components and parts. Before the surge in electronics manufacturing, Vietnamese export industries were mostly focused on clothing, textiles and shoes. In any event, both the U.S. and China have long been the two most important trading partners with Vietnam. Nowadays, inflation has fallen to a sleepy 3% and in spite of occasional hiccups the government treasury has been fat with cash and continuously been carrying a hefty foreign-reserve balance for the past few years. Vietnam seems likely to lead the region in growth for at least the next decade. The Vietnamese Dong (Symbol: VND) is Vietnam's official currency today. It's been issued since 1978. It follows in the footsteps of the original đồng, which was issued during the Viet Minh administration beginning in 1946 in order to replace the French colonial government's piastre. The modern root word đồng is derived from the old Vietnamese words đồng tiền,which come from the ancient Chinese term for “money.” Nowadays, in English it's simply called the Dong by its fans. The Dong is backed by Vietnam's strong economy, which has an exceptionally rapid growth rate. By good luck, Vietnam is located at the crossroads of Asian commerce. The country has large foreign-exchange reserves, so the Dong is well supported. The value of Vietnam's currency has been arbitrarily devalued several times during the past few years. Many observers nowadays believe the country's red-hot economy has far outgrown its currency's value. Dong banknotes nowadays feature world-class anti-counterfeiting measures. In 2003 Vietnam replaced the older cotton notes with state-of-the-art plastic polymer notes which last far longer. As long as you buy Dong from a top-rated dealer that provides authenticity guarantees, there is very little danger of counterfeits. Vietnamese Dong banknotes and coins have been produced in a wide range of denominations. Today, the same as in other nations which have been faced with inflation, Vietnamese consumers and business people tend to favor using only the higher-denomination banknotes for daily commerce. Back in 1978 the country's central bank authority, the State Bank of Vietnam (or Ngân hàng Nhà nước Việt Nam) began issuing banknotes in a wide range of values: 5 hào, as well as 1, 5, 10, 20 and also 50-đồng notes. All these first post-war notes were dated as 1976. In 1980 the government added both 2-đồng and 10-đồng notes, then in 1981 came 30-đồng and 100-đồng notes. During the political upheaval and business stagnation following the Vietnam War, by 1985 economic instability and inflation led to the discontinuance of the first series of đồng notes. Inflation forced the State Bank to print a new series of đồng currency in 1985, which ranged in value up to 500 đồng. The same pressures next led the Bank to issue another series of banknotes in 1987 with values from 1,000 to 5,000 đồng. Finally, notes with face values of 10,000 to 500,000 were printed at intervals during the years 1990, 1991, 1994, 2003, 2006, and some years thereafter. There are many currency dealers on the Internet, yet most of them are marginal businesses at best. Instead, you should work with a leading dealer. When you want to buy the Vietnamese Dong or any foreign currency, you should only work with a top currency dealer who can ensure your satisfaction. It's best to choose a dealer who offers low prices for the Dong and other currencies, while providing excellent customer support and service. When buying Dong, at the very least you should insist on a written guarantee of authenticity for the currency you buy. The top dealers offer even more: A full buy-back guarantee which lets you sell your Dong back to the same dealer if you ever decide you don't want it. The leading dealers will accept payment by e-check because those are the quickest, easiest, and safest way to pay for currency. Most importantly, the top currency dealers are registered with the Treasury as money-services businesses, and are also members of the Better Business Bureau (BBB). The very best currency dealer is Currency Liquidator.... It's an A-rated member of the BBB, and it has never had a complaint against it. That's the strongest qualification you'll find when you're ready to buy the Dong. Should I buy Vietnamese Dong? The Dong's value has fluctuated during the past few years. The foreign-exchange rate for the Dong was set artificially low in order to account for the inflationary problems of the past. Since the government austerity measures implemented during the late 1990s and 2000s, the country's economy has grown significantly while the value of the Dong has been stuck in a narrow range dictated by the State Bank of Vietnam. It seems like a contradiction – In 2004 Vietnam’s currency was valued at an exchange rate of about 14,000 Dong per Dollar, yet in 2015 the Dong is trading at about 21,800 Dong per Dollar. Many people are watching the Vietnamese economy enthusiastically. They expect it to flourish as the country continues to build its industrial and manufacturing base. Given the country’s broad resources and positive outlook, anything seems possible. Logically, at some point in time Vietnam’s economy and the Dong will receive the attention they truly deserve. 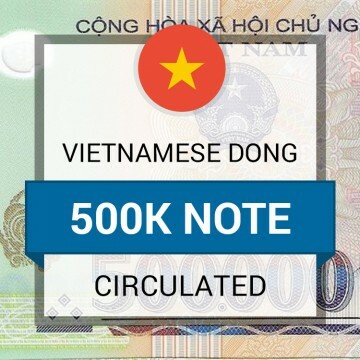 The Vietnamese Dong note has several advanced anti-counterfeit measures, which are easy to identify and extremely difficult to reproduce. There is more than one reason why we are the #1 customer rated Vietnamese Dong Dealer in the world! We are a US Treasury registered Vietnamese Dong dealer that is in full compliance with all US Treasury rules and regulations. All currency we sell is legally obtained, legally declared, legally transported, and clear for resale. While we specialize in the Vietnamese Dong, we carry many other exotic foreign currencies from around the world. Don’t see what your want? Contact us and we will get it for you. Get rewards for making Vietnamese Dong purchases, posting Vietnamese Dong reviews, referring friends, and so much more; use those rewards towards a new purchase. Talk to real people before, during and after you make a Vietnamese Dong purchase; your business and satisfaction is our #1 goal! All Vietnamese Dong we sell is guaranteed to be authentic and come with our company issued Certificate of Authenticity. Price is as important to us as it is you. That is why we guarantee the lowest prices on all Vietnamese Dong we sell period! Rest assured knowing your getting the most value for your money. Currently no banks buy or sell many of the exotic currencies we sell here. That is why its crucial you work with a dealer who can exchange your currency back to US dollars. No matter the amount of Vietnamese Dong you’re looking to exchange, we can exchange it guaranteed. Local, national and international Vietnamese Dong shipping is all done quickly and with precision. All Vietnamese Dong purchases are backed by our no questions asked, 30-day Money-Back guarantee, less a low restocking fee. Your satisfaction is our #1 concern. We will go above and beyond the call of duty to see to it that you are 100% satisfied with your Vietnamese Dong purchase. We won’t be beat on price, period. Compare us to any major dealer in the market and our Vietnamese Dong pricing will meet or be lower than any dealer guaranteed. All Vietnamese Dong we sell is guaranteed authentic, legally obtained, legally declared and from non-criminal origin. You will also be provided a Certificate of Authenticity. Even after our money back guarantee expires, you will still have the option to sell your Vietnamese Dong back to us at any point in the future. We guarantee a safe and secure Vietnamese Dong shopping experience. We use the same 128-bit encryption and physical security that banks use. We guarantee fast and safe delivery of your Vietnamese Dong. We ship all packages fully insured with tracking so you know where your package is every step of the way.